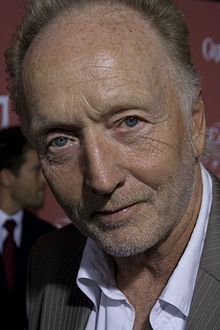 Tobin Bell (born Joseph Henry Tobin, Jr.; August 7, 1942) is an American movie and television character actor. He is known for his role of John Kramer/Jigsaw of the Saw movie series. ↑ The Cross & Crescent. 1962. Retrieved 2012-11-09. ↑ Barbuto, Dana (2008-10-24). "Weymouth native puts the buzz in Saw movies". The Patriot Ledger. GateHouse Media. Archived from the original on 2011-09-27. Retrieved 2008-10-28. This page was last changed on 20 February 2019, at 19:02.